Detlef Heun and Liliana Tagliamonte are flying this RV-7 around the world over the next two years. Their expansive route is impressive in many ways and to fully appreciate it, you must visit their website. During the two weeks prior to Oshkosh, Detlef and Liliana stayed with us here at Lee Bottom to rest up and ended up insisting on working around the field. 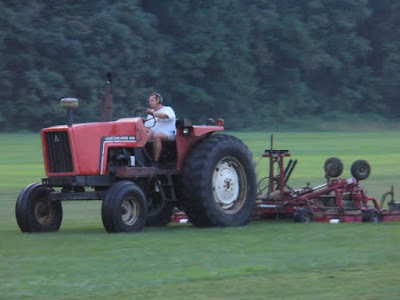 Here's a photo of Detlef giving the mowing rig a good workout. We're not sure how Detlef ended up in all these photos but here he is again. On this day, we found them parked under the legendary Oshkosh brown arch and while there, Detlef pulled out a Lee Bottom Flying Field decal and affixed it to their flying machine. We are extremely honored that they would want to carry our logo with them around the world. Knowing all the amazing work they put into this modified RV-7, it is extremely gratifying to know we earned a spot on its very slick finish. Get your tickets here . . .